In this video, we see Bill van Gilder showing us how he makes a square lasagna dish. Bill van Gilder is a potter that resides atop of South Mountain in Central Maryland. 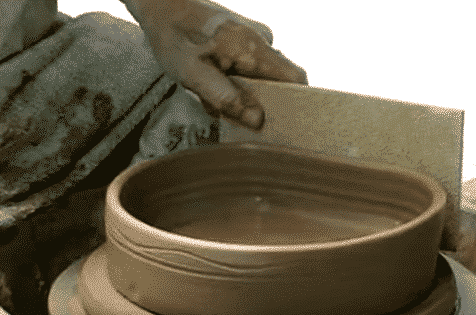 He has been a professional potter for more than 45 years. 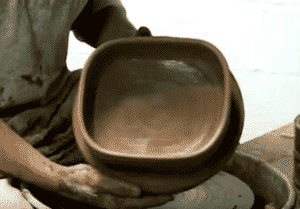 Bill has established and managed two large training pottery centers in Southern Africa. 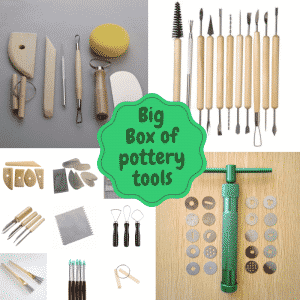 He also has designed a line of professional potter’s tools, called van Gilder ClayTools. Bill’s work focuses on functional forms for use and he glazes in an assortment of ways from high fire reduction to salt firing. Bill starts with placing a bat on the wheel head and dampening it before placing two and a half pounds of clay on the bat. He centers and then stretches and flattens it out by compressing it down with his hands and two thumbs. Bill then opens the pot and leaves the bottom a bit more than a quarter of an inch thick. The entire time Bill is doing this he is also compressing the lip down to keep it level. Bill compresses the floor, removes the excess water, and then ribs it flat using a plastic rib. Once the floor has been ribbed Bill wets the wall and pulls up the clay. He recommends a thick rim to ensure that it will not break from repeated use. After he pulls up Bill removes the excess clay from the bottom using his bevel cut tool and then puts a straight side into the clay using the same tool. Bill finalizes the shape of the dish by straightening the sides, placing a line on the outside to mark where the handles will be, removing the excess water from the dish, and cleaning up the form with the sponge. Bill uses a piece of Masonite, which is smooth on one side and fuzzy on the other to the proper squaring of the dish. It is now time to square the dish and Bill uses a wooden knife tool specifically since a normal knife or other tools might not separate the clay enough. Using the wooden knife tool Bill places four points in the clay that are opposite and parallel to each other. The points are around three inches apart from each other on both sides and Bill connects them using the wooden knife all the way through the floor. Then Bill creates a second line near the first by placing it at the first point and turning the wheel. This creates two small crescents that go down to the floor. Bill then cuts the form from the wheel in the direction of the length of the crescent cuts. He then uses a hook tool to remove the two crescents. There are now two empty spaces in the dish and Bill places a little pond of water in each hole. For Bill to create the proper squaring of the dish he uses a piece of Masonite , which is smooth on one side and fuzzy on the other. The fuzzy side does not stick to damp or tacky clay, which is what the outside wall is like currently. Bill places the piece of Masonite on the outside parallel to the crescent mark and presses the piece inwards to square it. Once it is squared he closes the cut by smoothing over it with his thumb tip and repeats the same method on the other side. A sponge is used to remove the excess water and then the rim is pressed out slightly to ensure the rim will not bend inwards after firing. Then Bill uses the Masonite to square the other two ends only slightly. To finish off his piece he cuts off the piece following the length of the dish and not the width of the dish. 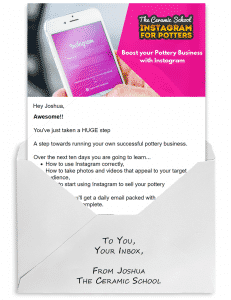 This ensures that the square form will not get warped as it gets cut off the bat. Bill concludes that he will let the dish dry out and then will attach handles later on. To see more of Bill van Gilder’s work find him on Facebook @BillVanGilderPottery, YouTube as Bill van Gilder, and check out his website vangilderpottery.com.